Description: Africa is a beautiful country, and is the birthplace place for life as we know it. These beautiful lovers are getting ready to tie the knot, and have decided that Africa is the perfect place to elope. Gorgeous animals, wondrous desserts, and stunning sunsets are just some of the reasons this couple wants to get marred in Africa. It's almost time for the ceremony, so this lovely bride is anxiously searching through her wardrobe for the perfect wedding attire. But, after spending several minutes looking for clothes and still coming up empty handed, she's beginning to worry that she won't be ready in time. 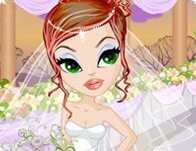 She could really use some help, so browse the wide selection of traditional African clothing to dress the bride for her fabulous African wedding in this fun dress up game! Instructions: Use your mouse to dress the bride up for her African wedding! Kings and queens aren't the only ones with royal weddings! Decadent gowns, crowns, and accessories will help make this a wedding to never forget. Select among the variety of the beautiful wedding gown to glamorize this bride. Create for her a beautiful hair-do and accessorize her figure to make this wedding perfect. Give this blond beauty the best day of her life! These poor souls were never married. Well, now they know they can fall back into love in the afterlife! Join them for their ghostly cute wedding day! Look at that adorable flower ghoul!